From January 1994 until September 1995, I was the auxiliary bishop of His Eminence Jaime Cardinal Sin, Archbishop of Manila. From September 30, 1995, I was the Bishop of the Armed Forces of the Philippines I until I became Lipa Archbishop in May 2004. That is when I met my fellow Military Ordinary, Bishop Josef Maria Punt and got to know about Our Lady of All Nations. 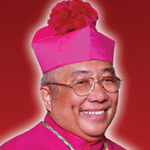 At the same time that I was bishop of the Armed Forces of the Philippines, I served within the Catholic Bishops Conference of the Philippines as Chairman of the Episcopal Commission on Migrants and Itinerant Peoples. In this capacity, I was often invited to visit several Filipino Communities all over the world, including the Filipinos in the Netherlands. Praying at the Shrine of the Lady of All Nations, each time I passed by Amsterdam, I realized that Mary, under this title, suits well the Filipinos known as and proud to be called PUEBLO AMANTE DE MARIA, expected to be the bearers of the Catholic Christian Faith to all Asia and who are now dispersed in almost all countries in the globe where they are oftentimes silent witnesses to the Good News. I speak a lot about the Blessed Mother to Filipinos within and the Philippines, under her title Our Lady of All Nations or Mediatrix of All Grace, the most prominent Marian title in the Archdiocese of Lipa. As the CBCP representative to be at the service of Filipino expatriates, I received an request to convene several assemblies Filipino communities across the USA from August till September of 2001. The latter half of September would have found me in the vicinity of New York. It is my habit whenever I would be in the East Coast, to include the Twin Towers in my visits. After the 9/11 disaster, I thought with trepidation that my curiosity could have cost me my life. I skipped my 2001 commitments in the USA when the Apostolic Nuncio to the Philippines made known to me that I must attend the Tenth Bishops’ Synod in the months of October and November as one of Pope John-Paul II’s chosen delegates. I could not in conscience absent myself from the Military Diocese for four months (August to November). I thought with gratitude to God that, becoming the pope’s unexpected and unmerited choice, Blessed John-Paul II saved me from being a victim of the Twin Tower tragedy. Besides this personal realization, that fateful event, from my point of view, had a bit of twist related to Our Lady of All Nations which is the motive of this brief sharing. that I would inquire from Rome the real state of the Our Lady of All Nations issue. The title ‘Our Lady of All Nations’ is a most worthy and meaningful name for Our Blessed Mother. The prayer is worthy of being promoted, disseminated and prayed by the faithful. Revering Mary under the above title, before the said picture, reciting the said prayer by no means violates any doctrine of Catholic Faith and morality. The 2002 letter of Bishop Punt recognizing the supernatural origin of the apparitions and messages of the Lady of All Nations is a very welcome document for us in the Philippines. More than ever the world needs to believe in the maternal concern of the Blessed Mother. Of all places the Virgin Mother chose Amsterdam to tell all nations about the love of God, the hope that Her Son brings. Send now Your Spirit over all the earth. I was mistaken in this date.